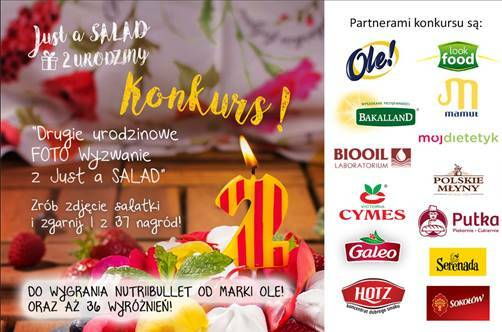 JUST A SALAD Contest: the blog turns two years old - OLE! To celebrate the second birthday of the Just a Salad blog, we had the pleasure of engaging in a cooking photo contest held under the slogan: “The second Just a Salad birthday PHOTO challenge”. The challenge was rather easy but required some ingenuity and a high dose of creativity. It was based on composing your favourite salad and taking a beautiful and tasty photo. OLE! sponsored the main prize: a Nutribullet and a bundle of OLE! products. The contest was really worth entering because the blogger gave out numerous consolation prizes to other entries before announcing the Winner.